England captain Alastair Cook and Ravi Bopara are both available to play for Essex in a 50-over game against Sri Lanka at Chelmsford on Tuesday. Cook will lead England in a one-day international series against the tourists, with the first of five matches at The Oval on 22 May. Bopara should also be part of Peter Moores' squad for the games. 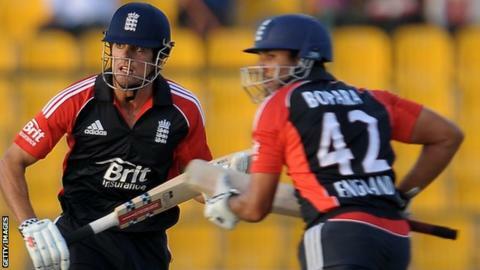 "Cook and Bopara are both available and we're looking forward to it," Essex coach Paul Grayson told BBC Essex. Essex start their T20 Blast campaign against Middlesex on Saturday, with Graham Napier and David Masters likely to be back from injury. Grayson hopes a limited-overs match against Sri Lanka will be good preparation for the competition. "Obviously Sri Lanka are world champions in the T20 format," he said. "Even though it's a 50-over game, it's a good indicator of where we are as a group before we go into the one-day competition." Meanwhile, the Chelmsford side are hoping New Zealand batsman Jesse Ryder, who is set to play in all formats for the county, will be available for the weekend. "We're working on his visa. It's been delayed - something to do with his passport. We hope he will be here Wednesday or Thursday," said Grayson.